Millions of people across America (not to mention worldwide) struggle with stubborn abdominal fat, which can be difficult to shed even when a healthy lifestyle is adopted. Not only is abdominal fat also called visceral fat or ‘belly fat,’ unsightly, it can lead to an increased risk of a number of health conditions. Some of the risks associated with carrying excess fat around your middle are a greater susceptibility to type 2 diabetes and heart disease. Additionally, as this fat tends to coat vital organs, it can cause system-wide inflammation that can trigger an array of other chronic illnesses. But according to the ground-breaking studies below, the effects of coconut oil on abdominal fat will surprise you! Cold pressed coconut oil is probably the most ‘prescribed’medicine food that I have been using in my practice over the last one and a half year with clients and patients worldwide. A 2009 study published in the Journal of Lipids consisted of testing the effects of either 2 tablespoons of coconut oil or 2 tablespoons of soybean on a group of 40 women over a span of 28 days. Results showed that the group that ate the coconut oil had a decrease in abdominal fat, while the soybean oil group actually showed a slight increase in belly fat. Additionally, the group that ate the coconut oil showed increased HDL ‘good’ cholesterol levels, while the soybean oil group had decreased HDL cholesterol and increased LDL ‘ bad’ cholesterol. The Journal of Nutrition published a study where researchers investigated all studies relative to medium chain fatty acids (MCFAs) that are abundant in coconut fat and weight management. The studies showed that diets rich in fats such as those found in coconut oil prompted a boost in metabolism, increase in energy, decrease in food consumption, reduced body weight and lower body fat mass. 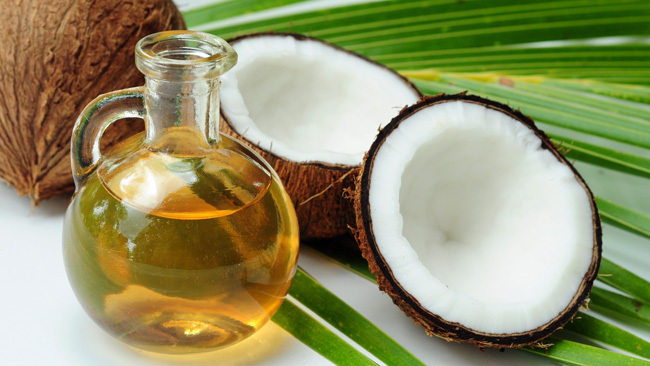 The authors of the study highly recommends using oils that contain MCFAs, such as coconut oil, as a tool to drop extra abdominal fat, manage a healthy weight, and even as a way to treat obesity. Yet another study that assessed body weight and fat storage relative to three different types of diets including a low-fat diet, high-fat diet with long chain fatty acids (LCFAs) and a high fat diet with MCFAs. In order to bring about weight gain, caloric intakes were adjusted for the diets. At the end of the research period (which lasted 44 days), the low-fat diet group stored an average of 0.47 grams of fat per day, the LCFA group stored 0.48 grams of fat per day, and the MCFA group only stored a mere 0.19 grams per day (despite purposely increasing calories). Those in the MCFA group (coconut fat) had a 60 percent reduction in body fat stored compared to the other diets. Another added bonus of consuming organic coconut oil (and coconut cream or milk) is that it tends to make us feel fuller for longer. Studies indicate that MCFAs help increase feelings of fullness and lead to a reduction in calorie intake when compared to the same amount of calories from other fats. When MCFAs are metabolized, ketone bodies are created in the liver – these have been shown to have a strong appetite reducing effect helping you to lose fat faster. I have personally switched to using this oil for all of my cooking and juices and since its cold pressed, it doesn’t really have a strong coconut flavor and doesn’t alter the change in taste of the food that much. Head Nutritionist and Master Coach, motivational speaker, published Author of ‘Eat Smart, Move More, Sleep Right – Your personal health coach’, sold globally, Luke has been involved in nutrition and fitness even since he graduated from IHM with specialization in food science and nutrition. Luke is an ‘International Collaborator ‘with the University of Yale, Griffin – Prevention research center, CT, U.S.A and practices in the field of nutrition, health, preventive and alternative treatment. Luke speaks at forums like the YPO, WPO, EO, etc worldwide on disease, nutrition, fitness and lifestyle. He encourages and helps people steer away from conventional medicine and uses natural foods. He believes in a lifestyle change and helps and coaches people to make ‘shifts in their lifestyles to achieve their health goals. What type coconut oil would you reccomend for belly fat ingesting? Informative article about facts of cold pressed coconut oil. agreed, Cold Pressed Coconut Oil has endless benefits. read more facts and benefits of coconut oil.